This photo from one of our Mykonos holidays shows four charter yachts docked at the island’s Old Port at Mykonos Town (foreground), and a cruise ship berthed at the New Port in Tourlos, nearly 2 kilometers away by road. 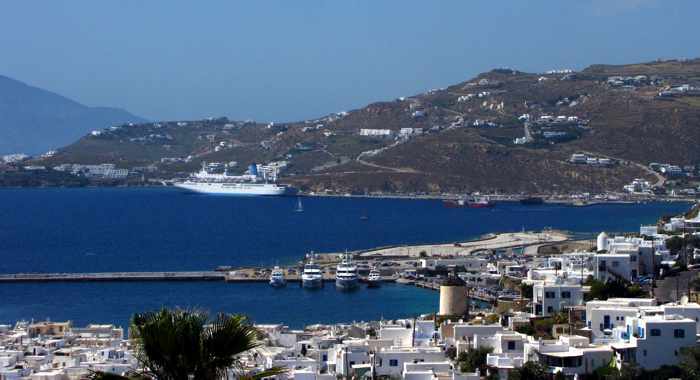 Ferry straightforward: Where does my ferry arrive at / depart from on Mykonos? 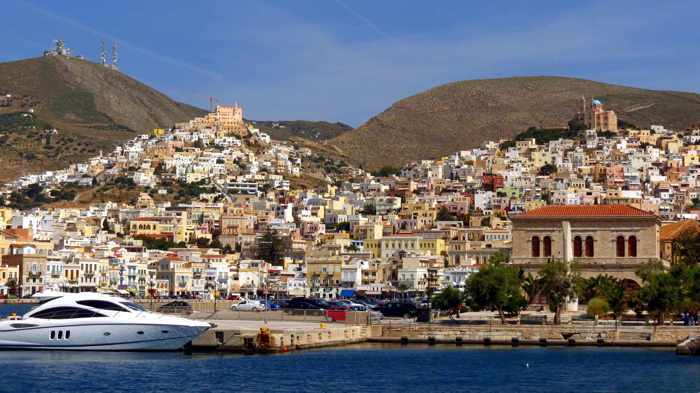 That question has vexed visitors for years, since the island has two ports — the original one at the Mykonos Town harbour (commonly called the Old Port) and a newer, substantially larger facility in the island’s Tourlos district (regularly referred to as the New Port, of course). The standard answer used to sound simple enough: ferries that carry passengers and vehicles sail to and from the New Port, while smaller ferries that just carry passengers operate from the Old Port. But since most travellers didn’t have a clue if the ship they were booked on carried vehicles or not, that advice wasn’t always helpful. Not surprisingly, many people missed their ferries because they arrived at the wrong port and didn’t have enough time to get to the right departure point. Thankfully, the reign of ferry port confusion could soon be history: As of Saturday April 6 2019, all ferry traffic to and from the island will use the New Port only. 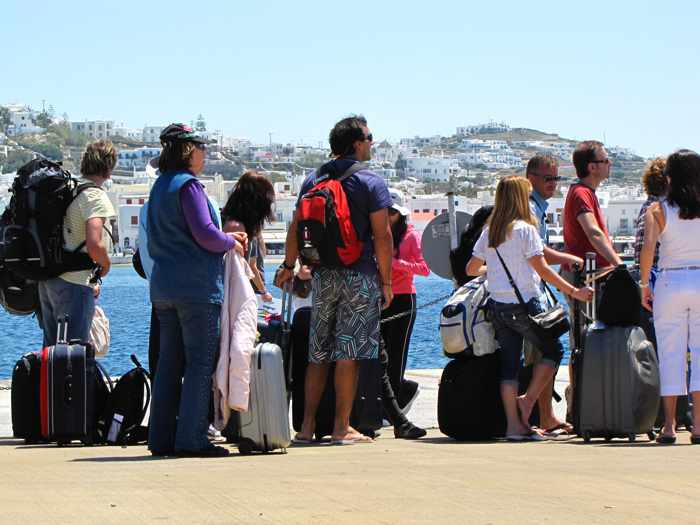 I shot these photos of travellers queuing to board passenger-only catamaran ferries at the Old Port in Mykonos Town several years ago. As of April 6 2019, the Old Port will no longer handle ferry traffic. One of my Mykonos holiday photos of the New Port at Tourlos. All ferry ships will now arrive at and depart from this harbour. 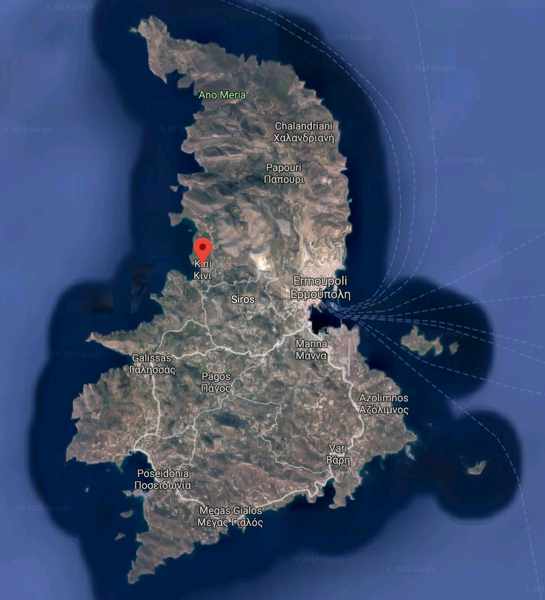 I learned about this development from Mykonos news websites, but the reports were all in Greek and Google Translate offered an awkward translation. To make certain I wasn’t misinterpreting what I had read, I contacted the top ferry booking agency on Mykonos, Sea & Sky Travel, to confirm if the news was accurate. “Yes, it’s true. All the boats, including the small passengers ones , will be leaving from the new port from now on,” a Sea & Sky representative told me. 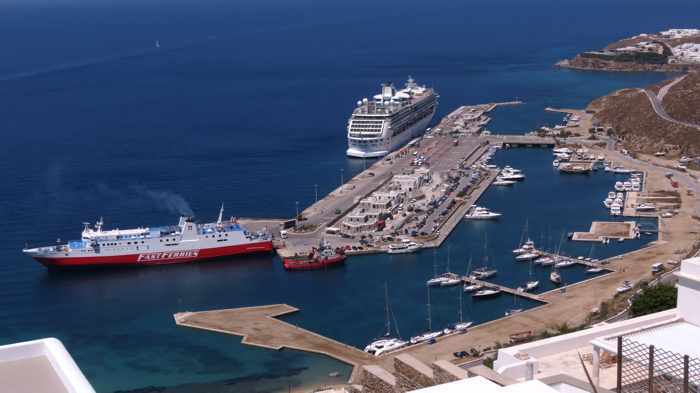 The news reports said the change was implemented by the Mykonos port authority, upon request by the Greek government ministry responsible for shipping and marine regulation, to eliminate confusion and help prevent passengers from missing their ferries. It’s a welcome change, but I think some confusion may persist for awhile. 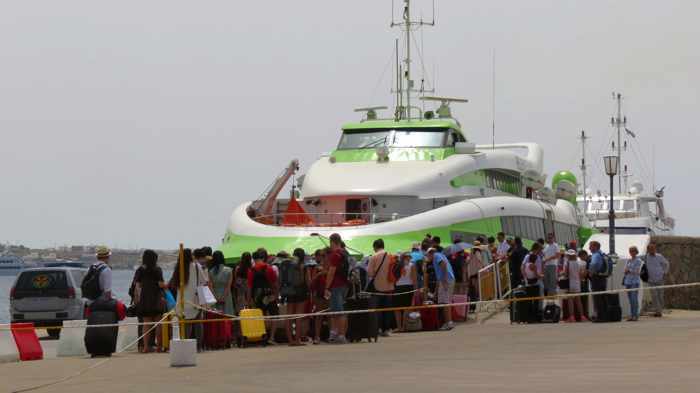 For one thing, many repeat visitors have travelled to and from Mykonos on passenger-only catamarans that operated in and out of the Old Port. If they don’t hear the news, their travel plans could get screwed up if they head to the Old Port, out of habit, when leaving the island. 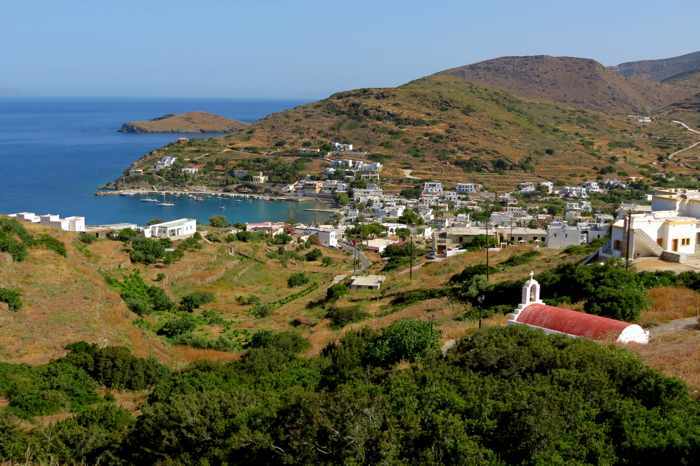 For another, many first-time visitors won’t be aware of the change, or may have read outdated posts on the TripAdvisor travel forums, or other online travel sites, that describe the old distinction between the two Mykonos ports. Hopefully word will get out and fewer people will miss ferries this year. 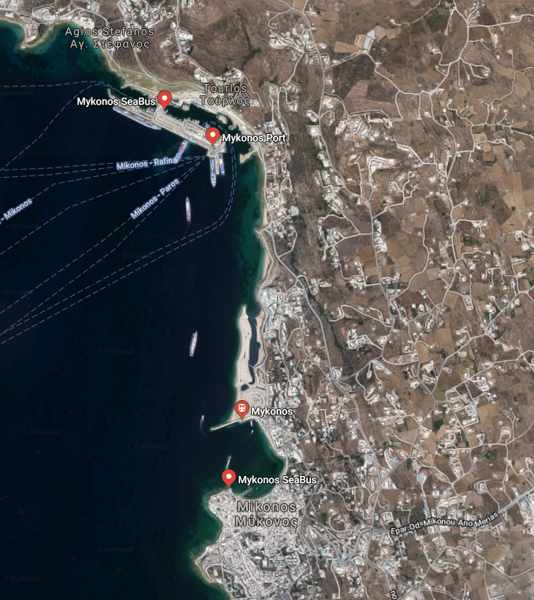 This Google image shows the Mykonos New Port (top) and the Old Port at Mykonos Town (bottom), a 2 kilometer walk or drive apart. Also shown are the main pick-up and drop-off points for the Mykonos SeaBus, an inexpensive water taxi service that operates between the two ports. Which leaves the next most popular question about ferry travel to Mykonos: How do I get from the port to my accommodations? 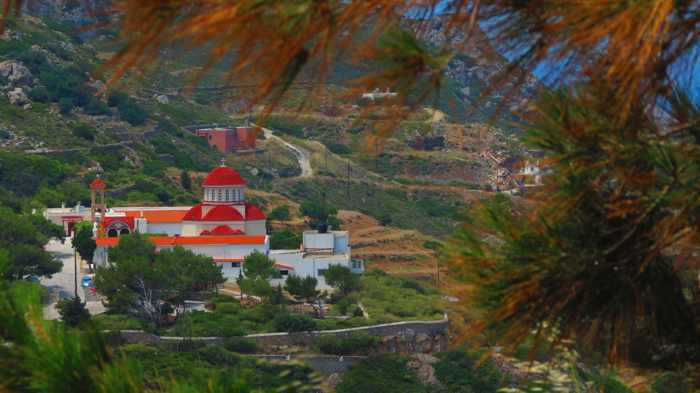 For a list of transport options, please click on the link below to continue reading on page 2 of this post, and to view photos of things visitors will see if they travel along the coastal road between Tourlos and Mykonos Town. 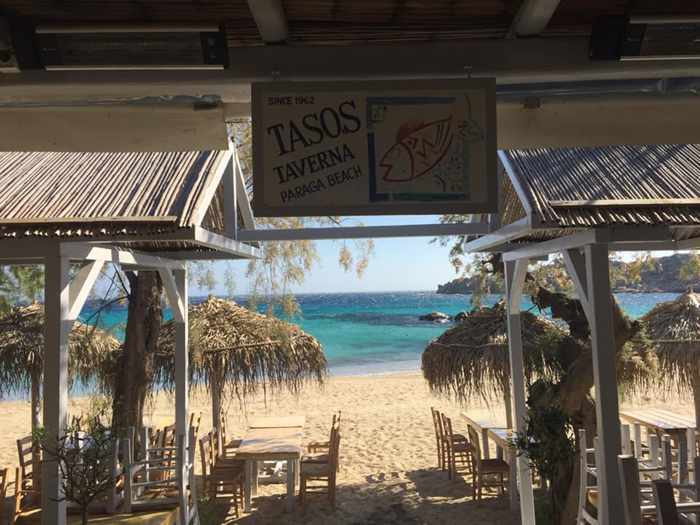 The beachfront of Tasos Taverna is seen in a photo posted on Facebook to announce its March 23 season opening. Located on Paraga beach, Tasos has been serving customers since 1962. 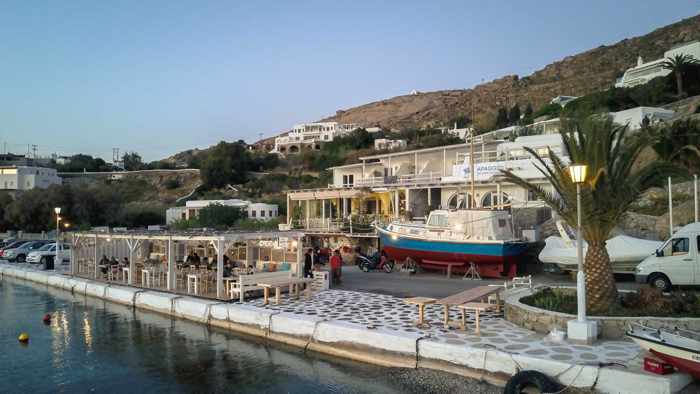 Season starts: Spring has only just sprung, but the tourism season on Mykonos has kicked off with a spate of bar and restaurant openings, plus the arrival of the first cruise ship of 2019. 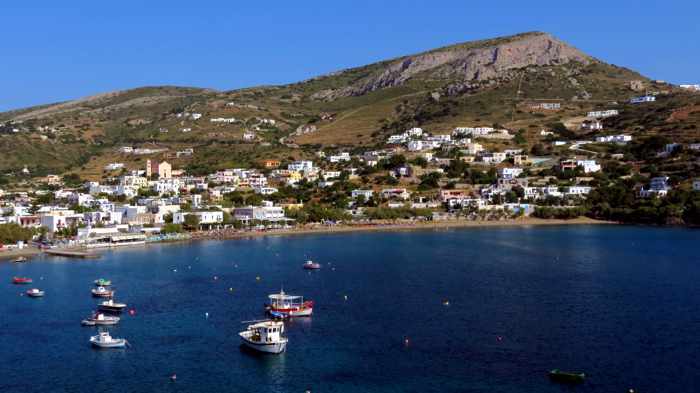 During the period of March 15 to 25, at least 10 establishments were set to officially open their doors, including two beach restaurants and, in Mykonos Town, several popular eateries and a bar. March 15 also marked the start of cruise ship port calls into Mykonos, with a visit by the Celestyal Cruises ship, Olympia. 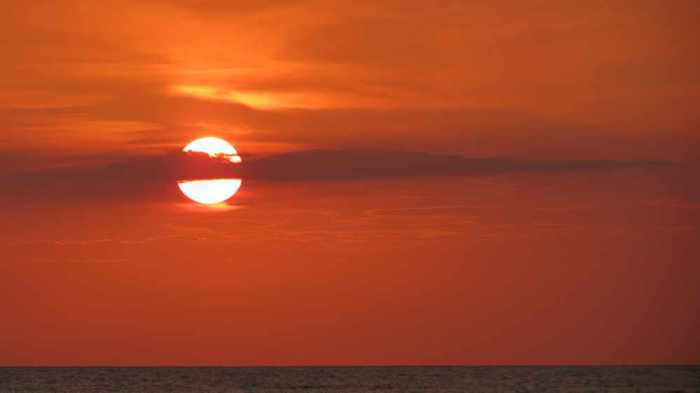 On most Greek islands, the annual tourist season is fairly short, and typically runs from the beginning of May until the end of September. With more than 10 places opening up during the third week of March, it might sound like Mykonos is getting things off to an unusually early start. But during the last four years, there has been a similar number of food and drink venues launching their seasons at this time, so I haven’t been surprised to hear of this month’s openings. The cruise ship visits, on the other hand, have indeed commenced sooner than in previous years. A March 18 news report by Greek Travel Pages notes that Celestyal launched its 3- and 4-night Aegean cruises two weeks earlier this year compared to last. It also is extending its season by two weeks in the fall, in response to what Celestyal says is a rising demand for travel before and after the summer season. 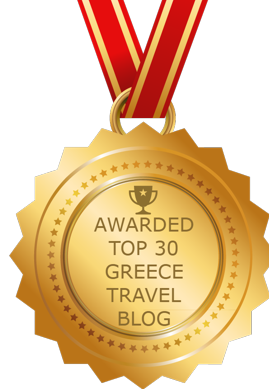 I, too, have noticed a greater interest in off- or early-season travel to Greece this year, both in messages and inquiries sent to my blog, and from requests for advice posted on the TripAdvisor Greece travel forums. This year I have fielded more questions than ever before from people who booked trips to Mykonos for dates in February, March and April. 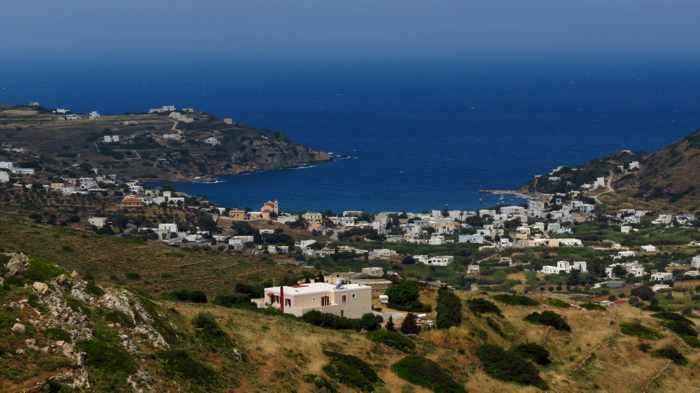 Many of those who wrote to me, or posted questions in online forums, were worried they wouldn’t have anywhere to eat or drink on Mykonos because they heard rumours that the island’s businesses are shut tight as a drum until May. That’s simply not true, since there are restaurants and bars that stay open all winter to serve the local population. The good news for people travelling to Mykonos between mid-March and May is that they will now have a much wider selection of places to enjoy a drink or meal, with more businesses opening each week until summer. 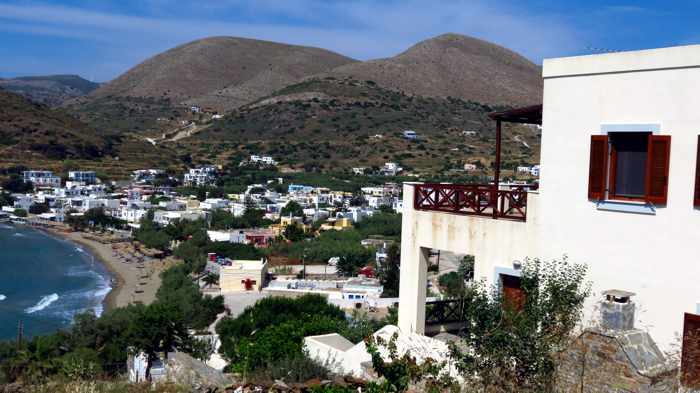 Apaggio, located on the seaside at Ornos, is open every day of the year. In fact, it hasn’t closed since it opened in 2013. Apaggio specializes in fresh fish and seafood, but guests also can choose from salads, warm and cold appetizers, meat and pasta dishes, Greek dishes and more. It has an extensive wine list, and a vast selection of ouzo and tsipouro. During winter, Apaggio is open from 12 noon until 11 p.m. 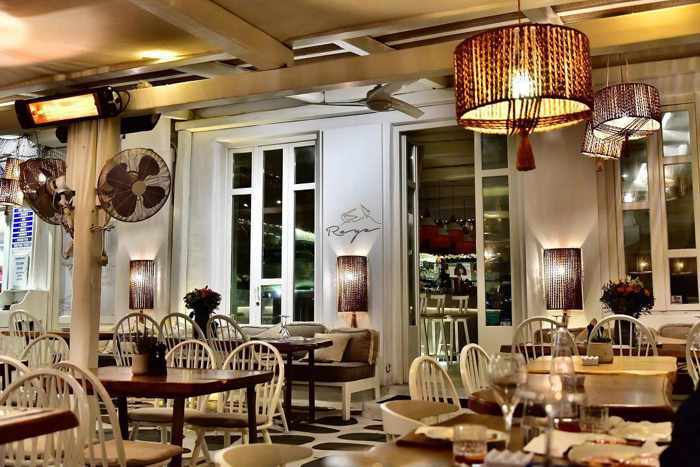 The restaurant has an indoor dining room as well as a large seaside patio, seen in the photo above from the Apaggio website. Raya, an all-day restaurant and bar positioned on the harbourside promenade in Mykonos Town, is one of the island businesses that doesn’t close up shop when the tourist season ends — it stays open all year. And it’s not just popular for food and drinks: Raya is known for its special Sunday parties, with music by DJs from Mykonos and Athens. This photo is from the Raya page on Facebook. 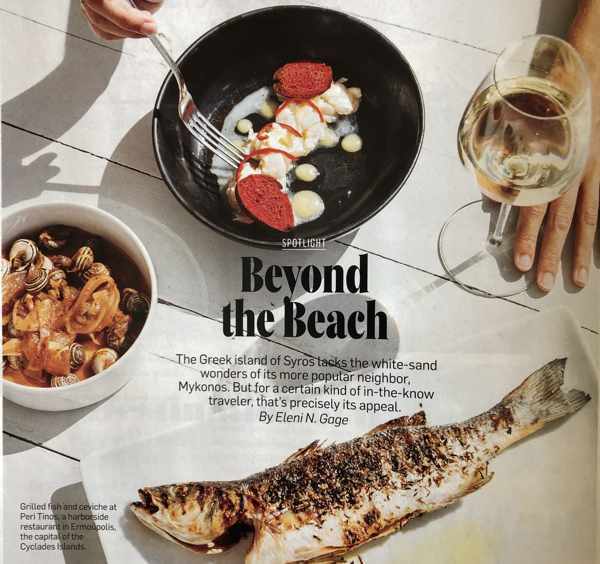 Please click on the link below to turn to page 2, where you can see which bars and restaurants have opened on Mykonos this month, along with places that opened even earlier, or have been open throughout the winter.